At least one Arab-American news outlet chooses to publish only online. Warren David, founder and former publisher of Arab America (previously Arab Detroit) started the website five years ago. David felt there "was a need for a website or digital media that would be able to communicate the Arab-American perspective," by covering events, news, and information while accurately portraying Arab Americans and uniting the Arab-American community. Arab America currently has "tens of thousands" of visitors each month, according to David. The publication also sends out a weekly e-newsletter to the 40,000 subscribers on its email listserv. 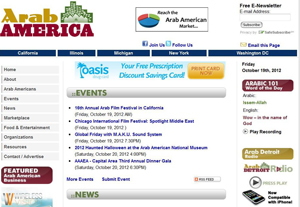 sites linked to from its main webpage, arabamerica.com. The community pages are for geographic areas with large Arab-American populations-California, Illinois, Michigan, New York, and the District of Columbia. Each of the pages highlights community events in those areas, national and international news, an Arab-American business directory for the region, and a national directory of Arab-American organizations. As with the mainstream news media, the line between traditional news sources and digital media is blurring. Manneh of New America Media attributes much of the growth in media to an increase in online content and use of social media beginning around 2009. Outlets are updating readers on community events and recent reports, "whether if it’s [on] their own website, or using Tumblr, or using Blogspot, or using some… aspect of the internet, they’re able to expand their reach… and the majority of those [newspapers] are also using Facebook and Twitter ." This is not to say that print newspapers are becoming obsolete within the community, but most publications have at least a small online presence. David’s wife, Amal David, has since taken over as publisher of Arab America.